I apologize for the lack of blog posts this week, but I am getting ready for David's 1st communion on Saturday and everything else is taking a back seat! Please pray that everything goes well! I’ve been thinking a lot lately about the choices we make in life. On any given day, we make any number of choices. Many are inconsequential – Cheerios or toast for breakfast, the red or black shoes, etc. Then, there are the decisions that change the course of one’s whole life – who to date, what college to go to, whether to get married or enter religious life or stay single, what job to take, where to live, and so on. Steve and Isaac Yoder write a father and son column for “The Wall Street Journal Sunday.” The column for April 26, 2009 focused on Isaac’s need to make a decision on which college to attend. Both father and son suffer from difficulty making decisions. In this particular column, they were discussing an article by Professor Barry Schwartz on “The Paradox of Choice.” The point of Prof. Schwartz’s article is to make a decision based on your “core requirements” rather than searching for the “elusive best.” Those who are satisfied with less end up happier in the long run. It is true. Regret serves no real purpose. I have a good life and I am very thankful for it. Spending time wondering what might have been is time wasted. Life might have been better or worse. The only guarantee is that it would have been different. God is also bigger than any decision I have made or may make. I am firm believer that God can bring good out of anything. If we screw up the plan, God comes up with another one for us. God is forgiving and good. He knew when He gave us free will that sometimes we would make decisions other than the ones He would have made for us. I don’t think that means that God stops using us to achieve His purposes. It might take longer. We might have to get there by a more convoluted route, but if we try to live a God-centered life, God will somehow help us to achieve the life we were meant to live. I take great comfort in that. At the Catholic Writer's Group I belong to, there has been an on-going discussion of whether blogs are worth the time, whether any one reads them, and whether they actually help advance our careers as writers or just use up time we could spend on more profitable ventures. I agree that blogging may be taking a backseat to social networking such as Facebook and Twitter. I have seen blogging be referred to as the new "old media." After all, we bloggers still tend to write in complete sentences and in more than a few words at a time. I think that social networking has a lot to offer. I enjoy Facebook and use it as both a tool to keep in touch with friends and promote the Catholic faith. I enjoy blogging, however, and I enjoy reading others' blogs. I keep track of them in my reader and look forward each day to seeing what others are posting about. As much as I enjoy getting quick status updates from my friends on Facebook, I appreciate the time and energy that goes into a blog post. Also, blog posts are open to the world. Anyone can Google a topic that someone has blogged about and find that page. Only my "friends" can view my Facebook links and comments. Therefore, blogs have much more evengelization power. Maybe (I can hope!) one of blog posts can provide a reader just what they need on a given day. Maybe one of my blog posts has made a difference in some one's life. I know that other blog posts have made a difference in mine. So, to all of you who take the time to write your blog posts, I say thank you. And to those of you who take the time to read mine, I extend an even bigger thank you. Without you, I would have no reason to write. I am pleased to announce that I have been invited to become a contributor to the Catholic Media Review blog. Allender acknowledges that it is difficult to dedicate one day to experiencing joy and beauty and delight. It might be hard to dedicate one day in a lifetime to that, much less one day each week! Yet, Allender invites us to make a concerted effort to do so. 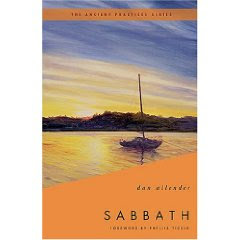 Allender examines how we treat time in this over-stressed twenty-first century world and encourages us to take a second look at the value of taking that weekly Sabbath to sanctify time. He also discusses the value of feasting and of play. It will take some preparation on the other days of the week, but we need to open our hearts to the gift of the Sabbath. One chapter that was very insightful was “Sabbath Play: Despair Surrenders to Joy.” Allender explores what it means to regret and despair. “Both regret and worry assume there is no God, or at least not one who loves and pours himself out for his children. . . Despair shows itself in cynicism, conventionality, and consumerism.” Sabbath invites us to set those feelings aside. Gratitude and joy are to be the dominant emotions of Sabbath. The only criticism of this book is that Allender didn’t seem to place much value on attending religious services on Saturday or Sunday. My sense is that he tried to make this book accessible to all people of faith, even those who consider themselves to be “spiritual but not religious.” Overall, however, Allender offers considerable food for thought. At the time, I couldn’t appreciate the wisdom of that statement. After all, my children were still very small. I loved them so much, but mostly, they left me exhausted. My struggle with adjusting to motherhood was one of the primary reasons I was seeking a spiritual director. I was at a loss as to what God wanted from me. Thankfully, my spiritual director was able to help me sort it all out. In the intervening years, however, I have come to appreciate all the ways my children are helping to direct my spiritual journey. As any mother will tell you, children have a way of bringing out all your weaknesses. Somehow, they just know how to push all the wrong buttons. Reminded of one’s failings on a daily basis, there can be really no question of what one needs to work on. Thankfully, children also give their mothers plenty of opportunities to work on those weaknesses. Every day is a new challenge! Children can also be a mirror sharper in focus than any other. It is one thing to see your faults in yourself. It is a whole different perspective to see your faults in your children. Either through genetics or upbringing, or a combination thereof, our children often suffer from the same issues we do. In helping them to work through their challenges, God also helps us to work through our own. Parenting also helps us to recover from our own childhood and make peace with our own family of origin. I haven’t met a person yet who escaped from childhood unscathed. Growing up is hard and painful. We tend to blame our parents for much of that pain, sometimes with good reason, sometimes just because they are easy targets. Parenting one’s own children provides a whole new perspective on those relationships. At least in my case, I know that realizing how hard parenting is helped me to forgive my parents for all the mistakes that I had felt they made. There is something incredibly humbling about knowing that, even though I get up every day and try to do my best, my children will feel that I made huge errors in their upbringing. It also encourages me to beg for God’s help. If there was ever a time when I needed God, this is it. God made my children. He is only one with the instruction manual. Children do help determine the course of our spiritual development in ways that I couldn’t even have imagined years ago. I’m sure as my children continue to grow into adulthood, God has many more lessons to teach me through them, even as I am helping them navigate their own paths. We will continue to travel on our spiritual journeys together. Visit Catholic Blog Fiction today to read a one-day excerpt from "Shalom, Mary" by Kathleen Techler. Marybeth Hicks has written a very good article on A Woman's Place in the Church for Catholic Mom. The hope is that faith is so much a part of your life that you can't help but bring it up at the dinner table. You end up talking about what happened in the news or praying for people who are sick and hurting. What would it be like for your sons and daughters if, instead of hearing the "Today Show" when they wake up in the morning, it was quiet and you were sitting on the couch with a candle lit and scripture in your lap, meditating? What would it be like if your son or daughter saw you doing Christian service regularly and not just because you have to as a parent to get your kid there? I call it living faith out loud. Not letting it be a secret, but living it openly at home so your young people catch it, learn it, ask about, grow in it. That's how faith gets in them. What if You Are Still in the Desert? The Lord is Risen! Alleluia! The Church on Easter Sunday was festively decorated. Flowers were everywhere. The purple was gone. The Easter Candle was shining brightly. The “Gloria” and “Alleluia” were sung with great enthusiasm. There was joy and celebration everywhere! This is as it should be. If only life was as neat as the Church’s liturgical seasons! We could spend six weeks in the desert and then wake up one day and be free of all the temptations, all the sin, and all the pain and suffering. We could lay all our pain at the feet of the Risen Jesus and be rid of it forever. Life isn’t that simple, however. Many times, our desert experiences last much longer than forty days. Sometimes, it seems like we spend more time in the desert than anywhere else. At times like this, it can be hard to truly celebrate the Easter season. It can be difficult to rejoice in the Risen Lord when He seems nowhere to be found. What, then, is a heart and soul to do? It is in those days in the desert that loving and rejoicing in Jesus becomes an act of the will. We can choose to believe, choose to rejoice, and choose to love. Mother Teresa provides an incredible example of a person who continued to rejoice in the Lord for decades even though she experienced no consolation. Her faithful service provided the world with so much goodness and so much fruit, yet her own heart was hurting. She believed that God loved her even when she could not feel that love. She continued to pray and place herself in God’s presence. Mother Teresa continued to trust in the Divine will. We can do the same. Even when we don’t feel God’s love, even when we are in the midst of pain and suffering, we can continue to pray and lay our sorrows at the feet of the Lord. We may not feel like celebrating, but we can force ourselves to focus on the wonder of the Risen Lord. Jesus loved us so much he died to save us from our sin! He rose from the dead to conquer the greatest pain life has to offer. We have the gift and the promise of eternal life! How can we not rejoice? There is hope of a brighter tomorrow. In the midst of our days in the desert that hope may be the greatest gift of all. Fasting is one of the ways the servants [of Jesus] keep themselves alert in this future-oriented waiting until the bridegroom returns. To what could you liken their discreet, mysterious joy as they wait? You could say it is like the quiet humming or whistling of a choir member earlier in the day of the concert. It's like a mother and father cleaning the house and making up the beds in anticipation of the kids' coming home at Thanksgiving or Christmas. It's like standing in the airport terminal or train station, waiting for your loved one to appear. It's like a fiancee patiently addressing the wedding invitations. The long-awaited event is not here yet, but it will come, and this is necessary preparation. In each case the energy is upbeat, forward-looking, and marked by the quiet joy of anticipation. This was sent to me by a friend. Sounds like a good idea to me! Please help spread the word. Imagine what might happen if every Catholic in the world would pray a Rosary on the same day! We have an example in October of 1573, when Europe was saved from the invasion of the mighty Turkish fleet. Europe was saved by the praying of the Rosary by all Christians! So, on Good Friday, let's all pray a Rosary for the intention of ending Abortion and Terrorism. If possible, please pray your Rosary between the hours of 12noon and 3:00pm. “Fasting” by Scot McKnight is the fourth in “The Ancient Practices Series” edited by Phyllis Tickle. McKnight has a very limited view of fasting. He considers the term “fasting” to be appropriate only when talking about not eating at all or subsisting on just liquids. What most of us today consider fasting, that is, eating less food or refraining from certain foods, McKnight categorizes as “abstaining.” This is unfortunate because I think that will make this book appeal to a very narrow group of people. McKnight does do a good job of explaining Biblical fasting, especially that the reason for it was in response to a “grievous sacred moment,” whether that be grief or repentance for sin. He emphasizes that fasting should never be done as a means to an end, but always in response to a life event. He describes the various aspects of fasting, such as fasting as body turning, fasting as body plea, fasting as body grief, fasting as body discipline, fasting as body calendar, and fasting as body contact. He is intent on focusing on fasting as uniting body and soul. He also describes some of the problems associated with fasting and health issues to consider. I really wanted to like this book, but I don’t think that it achieved its purpose. If the intent of this series on ancient practices is to convince people of the value of them, this one missed its mark. Its focus is too narrow and McKnight is too critical of the reasons why people might try fasting or abstaining (which I feel does have great value). At the Holy Thursday liturgy we celebrate the institution of the Eucharist. Jesus loved us enough to create a sacrament in which he physically comes into our body and soul – what an amazing gift! Yet, I admit, I often take it for granted. Don’t get me wrong – I look forward to going to mass each week. I wouldn’t be able to make it through the week without the spiritual sustenance. I know that, and yet, in the midst of mass, my mind often wanders. I’m focused on how my children are behaving or thinking of what we are doing the rest of the day, or pondering something that might have happened during the week. My body is there, doing the motions, but my mind is far away. I go up to communion and kneel down to pray, but I’ve lost much of that wonder at the Eucharist that I had as a child. When I was four, I couldn’t wait to receive my First Communion. I wanted Jesus so much. It was an eternity to wait until I was seven for the big day! My older son is making his First Communion next month and he is just as excited, and I am excited for him. Every week when we come back from the communion line, he says “Just a few more weeks and it will be my turn!” I know that Jesus is already with him, but I am hopeful that receiving Jesus in the Eucharist will give him some added strength and grace. I know that the Eucharist is an incredible gift that we are so blessed to be able to receive. I know that there are people out there who are conscious of the mystery and tremendous gift of the Eucharist every time that they receive communion. I know one man who actually cries during mass because it touches him so deeply. For those of us, however, who do not always remember, Holy Week provides the perfect opportunity to rediscover this priceless treasure. At a time when we focus on the ultimate sacrifice that Jesus made for us, we also recall his last gift to his friends before his death – the gift of himself. “Now as they were eating, Jesus took bread, and when he had said the blessing he broke it and gave it to the disciples. ‘Take it and eat,’ he said, ‘this is my body.’ Then he took a cup, and when he had given thanks he handed it to them saying, ‘Drink from this, all of you, for this is my blood, the blood of the covenant, poured out for many for the forgiveness of sins.’” (Matthew 26:26-28) Jesus is that close to us. He wants to be part of us. It is the most intimate of connections. We need to treasure it.